Bio: Dr. Susan McCouch is the Barbara McClintock Professor of Plant Breeding and Genetics in the School of Integrated Plant Sciences at Cornell University. She received her PhD from Cornell in 1990 and spent 5 years with the International Rice Research Institute (IRRI) in the Philippines before joining the Cornell faculty in 1995. She is well known for her pioneering studies on molecular mapping in rice and the development of genomics-based platforms to explore the extent, distribution and phenotypic consequences of genetic variation in Oryza. 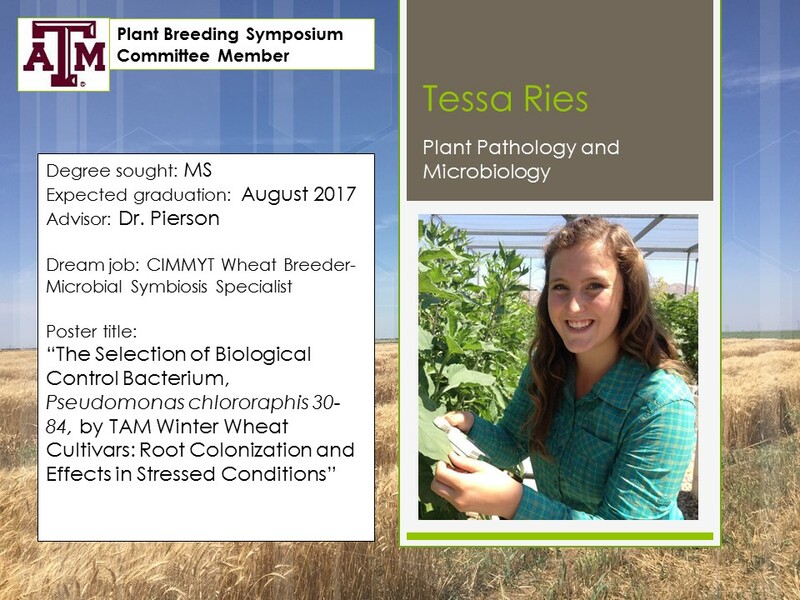 Researchers throughout the world utilize the molecular markers, genotyping platforms, analysis protocols and germplasm resources developed in her lab for genetics research and breeding applications. She has trained scores of young scientists who contribute to rice research nationally and internationally and has a prolific publication record. She is the recipient of numerous teaching and faculty awards, is an elected fellow of AAAS. She has served as scientific advisor on the Global Rice Science Partnership (GRiSP), the NSF Advisory Committee for International Science and Engineering (AC-ISE), and as Chair of the AAAS Section on Agriculture and Natural Resources. Linking genome wide association studies (GWAS) and genomic selection (GS) to better utilize natural variation in rice. Abstract: Understanding the relationship between genotypic and phenotypic variation lies at the heart of the study of genetics and is also critically important to applications in plant breeding. Here we present a genome-wide association study (GWAS) based on genotyping a rice diversity panel with a high-density SNP array and systematically phenotyping the panel for a range of agronomic, physiological and morphological traits. Seeds conserved in global germplasm repositories, including wild rice ancestors, ancient landrace varieties and modern elite cultivars provide insight into a wide range of natural genetic variation that remains underutilized in modern rice genetics and breeding. Using high throughput sequencing and genotyping technologies, we examine genome-wide patterns of variation and document deep sub-population structure within Oryza sativa. We use GWAS to identify common variants influencing complex traits and demonstrate heterogeneity of genetic architecture across subpopulations and environments. We use genomic selection (GS) in combination with de novo GWAS to predict breeding values and improve the rate of genetic gain. This work establishes an open-source translational research platform for genome-wide association studies and genomic selection in rice that directly links molecular variation in genes and metabolic/regulatory pathways with the germplasm resources needed to accelerate varietal development and crop improvement for diverse environments. Bio: Dr. Colin Khoury is a Crop Diversity Specialist at the International Center for Tropical Agriculture (CIAT), Colombia, and a researcher at the USDA National Laboratory for Genetic Resources Preservation in Fort Collins, Colorado. Colin's interest is in enhancing food security, human health, and the sustainability of agricultural production systems through the conservation and use of crop genetic resources. Most of the time he is researching how we can better conserve the wild relatives of our food crops and trying to understand how changes in diversity in our diets and agricultural production impact food security. Abstract: Seventy five years after N.I. Vavilov’s death, the brilliance of his botanical research continues to inspire those charged with making crops more productive, resilient, and nutritious. At the same time, the story of his courageous and ultimately tragic life remains pertinent both to the appreciation for objective science in improving human lives, and to the importance of conservation of crop genetic diversity for our long-term food security. In this presentation I recount a number of the great ironies of Vavilov’s life, and outline the scientific progress since that time in delineating the geographic patterns of crop diversity, globalizing efforts to conserve and share these genetic resources, and employing this diversity in order to respond to changing human health and agricultural production challenges. Bio: Dr. Paul Gepts is a native of Belgium, where he obtained his “agronomic engineering” degree, equivalent to a MS degree in the U.S. He worked for three years at the Gene Bank of the International Center for Tropical Agriculture (CIAT) in Cali, Colombia, where he led a project emphasizing the genetic resources of Phaseolus beans. 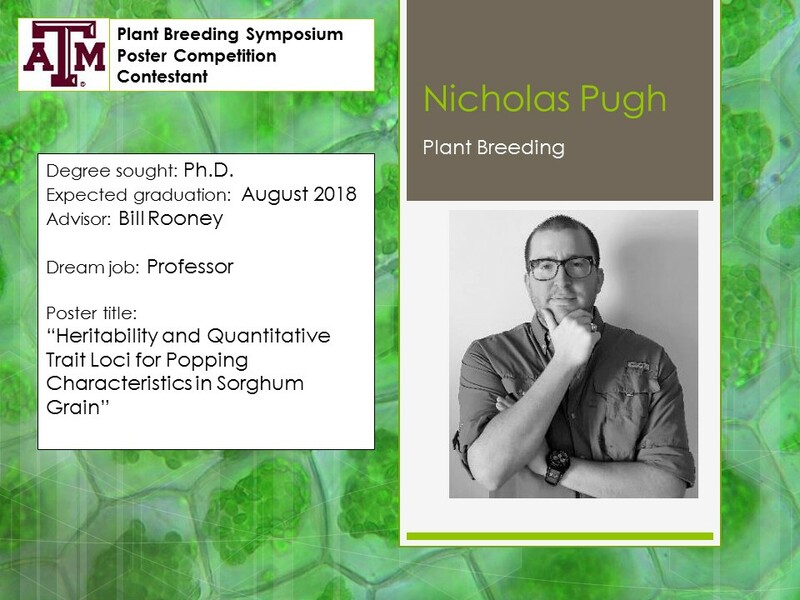 His results demonstrated the interest of using runner bean (P. coccineus) and year bean (P. dumosus) as sources of genetic diversity in common bean (P. vulgaris) breeding. His PhD research at the University of Wisconsin-Madison was focused on the domestication and evolution of common bean. Following a postdoc at the University of California, Riverside, Dr. Gepts joined the faculty of the University of California, Davis, where he is now a distinguished professor, bean geneticist, and head of the bean breeding program. 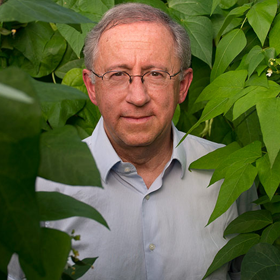 During his tenure at UC Davis, he has expanded his research on bean genetics, by developing genetic and genomic tools of beans, including recombinant inbred populations, BAC libraries, and PhaseolusGenes, and a marker database. His research has shown 1) the existence and gene flow in bean species, in spite of the predominant self-pollination and the potential for displacement of genetic diversity of wild beans; 2) the presence of co-evolution between the bean host and some of its fungal and bacterial pathogens based on recruitment of differential resistance specificities from the same disease resistance gene cluster; 3) the role of long-distance dispersal of ancestral bean types in establishing the current distribution of wild beans; 4) the role of farmers in traditional agriculture, including centers of domestication, in generating and maintaining crop diversity, as described in surveys of in situ diversity and molecular diversity of domestication genes. Abstract: The genus Phaseolus includes no less than five domesticated species, two of which have been domesticated at least twice. Thus, this genus provides an interesting experimental model for research on crop domestication and genetic diversity, and applications to genetic conservation. After a brief review of the concept of Vavilovian center over the latest centuries until today, I will discuss this concept in the case of the genus Phaseolus, and more in detail for common bean, the domesticated species that is currently the most important economically in the genus. Following a review of the uses so far of wild beans as a source of genetic diversity, I will present more recent results from a landscape genomics study of the distribution of wild common bean combined with DNA sequence level variation, as a prerequisite to identify both accessions and genome regions potentially involved in temperature and drought tolerance. Bio:Charles E. Simpson, Professor Emeritus of Texas A&M AgriLife Research, Texas A&M AgriLife Research and Extension Center, Stephenville, TX has been the Project Leader of the Peanut Wild Species Program since 1967 and continues in that position, semi-retired. He has developed several pathways for gene introgression. He and colleagues released the first peanut cultivars with genes introgressed into the cultigen from wild Arachis. The most significant of these was the transfer of resistance to root-knot nematode into cultivated peanut. He has been leader or co-leader and participant on 28 expeditions to collect cultivated and wild Arachis germplasm in South America. The teams have collected more than 1800 accessions of wild peanut, including more than75 new species of Arachis, more than 5000 cultivated land races and more than 500 accessions of Rhizobia. Simpson entered Texas A&M University in 1960, where he earned a BS in Agr. Education in1963. He received a NDEA Graduate Fellowship, whereby he earned a MS in 1966 and his PhD in 1967, in Plant Breeding and Cytogenetics at Texas A&M University. In September 1967 he was employed as Peanut Breeder at the West Cross Timbers Experiment Station at Stephenville, Texas, which was later designated as a Research and Extension Center of the Texas Agricultural Experiment Station. From the very beginning he has been involved in the biodiversity in the genus Arachis. Simpson was promoted to Full Professor in 1984. In 1979 he was appointed to the Graduate Faculty of Texas A&M University. He has been author or co-author on 20 peanut variety releases and Registrations with Crop Science; he served on the Crop Registration subcommittee for Peanut for more than 30 years; he received the Meyer Medal in 1993 for his work on collection, maintenance, distribution and utilization of Arachis germplasm, and in 2015 he was selected to present the Calvin Sperling Memorial Lecture on Biodiversity at the ASA CSSA SSSA meetings. Simpson is author or co-author on a total of 124 refereed journal articles, author or co-author on 14 book chapters, and he co-translated the Peanut Monograph from Spanish to English. In 1983 Simpson was a PI on the first Peanut CRSP, and has continued activities with that program and its replacement, PMIL, to this day. He trained and helped train 14 different persons in that program. Simpson has served on graduate committees of more than 16 MS and PhD students, serving as co-chair of 7 students. He has also mentored numerous MS and PhD students from Argentina and Brazil. Abstract: The genus Arachis originated on the old Brazilian Shield after a mid-Tertiary uplift of the Shield, probably in the area that is now southwest Brazil or northeast Paraguay. Remnants of the old, eroded Shield are still evident in that area and the two most primitive species, based on morphological classification, continue to reside there today. From that origin of the genus, the species, 81 described to date, have evolved and have been dispersed, mostly by running water to an area as follows: starting at an island in the mouth of the Amazon, westward to north Bolivia, then southward along the eastern Cordillera of the Andes (up to 2000 meters), to northern Argentina; from there, then east to the Rio La Plata and southern Uruguay, then north back to the Amazon. Another 12 to 15 species have been collected and are in various stages of evaluation to be described soon. It is projected that the total number of species will reach 115. There have been nine taxonomic sections described, and the largest number of species has been assigned to the most advanced section Arachis which includes the cultigen, Arachis hypogaea L. The cultivated peanut is a tetraploid with 2n=4x=40 chromosomes, but most all of the wild relatives only have 20, except for one group of the section Rhizomatosae which also has 40, and a group of four species which has just 18. The cultivated peanut is a relatively young species originating about 3500 years ago in the gardens of hunters/gatherers somewhere in the western part of Argentina and/or Peru. Despite significant morphological differences in the two taxonomic sub-species and six botanical varieties of the cultigen, A. hypogaea is recognized as having a narrow genetic base. Numerous useful traits for improvement of the cultigen have been identified within the wild species of Arachis. Some of these traits include: disease resistance, insect resistance and drought tolerance, as well as improved quality traits to enhance the edible condition of peanut. To date, we have introgressed genes for resistance to two root-knot nematode species, early and late leafspot resistance, rust and web-blotch resistance, leaf feeding larva resistance and increased oil content. We are developing introgression pathways for other traits, including drought tolerance and white mold resistance. Our primary objective is to utilize the wild relatives of Arachis to improve peanut cultivars. Bio: L.J. 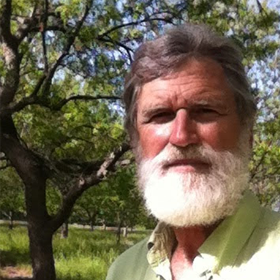 Grauke is Curator of the National Collection of Genetic Resources for Pecans and Hickories (NCGR-Carya). The collection is the major germplasm repository for the genus Carya in the United States, and is dedicated to the collection, maintenance, evaluation, characterization and distribution of world genetic resources for that genus. He has made collections of pecans and hickories throughout the United States as well as in Mexico, Vietnam, and China, developing and maintaining the living collections that comprise the NCGR -Carya. He has worked to develop reliable molecular genetic markers to characterize the geographic distribution of genetic diversity across the genus. Grauke is Research Horticulturist for the USDA-ARS Pecan Breeding & Genetics program. The major objective of that program is the development of improved pecan cultivars and rootstocks for all U.S. production areas. He contributed to the release of several pecan cultivars currently in use by the pecan industry. In addition to the routine evaluation of selections under test, research is also conducted for the improvement of selection criteria using standard field observations and molecular genetic techniques. Abstract: The USDA ARS National Collection of Genetic Resources for Carya (NCGR-Carya) has been dramatically impacted by Vavilov’s contributions. However, the constraints of our genus create unique challenges. Pecan [Carya illinoinensis] is a large, slow to bear, long-lived, wind-pollinated, out-breeding, deciduous tree species native to North America and Mexico. The archaeological record of Carya nut use by humans spans over 10,000 years, while pecan cultural development in grafted orchards began in the mid 1800’s. Diverse stands of largely unmanaged native trees compete in the market with nuts from intensively managed orchard systems. Co-evolved insects and diseases exert selection and management pressure and provide targets for improvement through breeding. The USDA Pecan Breeding Program began in 1930, with the goal of producing large crops of high quality nuts for use in regionally diverse, grafted pecan orchards. Until 1998, the USDA effort was the only pecan breeding program. The cultivars used as parents by the first breeder became the core of the National Clonal Germplasm Repository for Pecans and Hickories when it was designated in 1984. At the first meeting of the ad hoc Crop Germplasm Committee in 1984, a Vavilovian strategy was adopted to collect range wide native populations of pecans to represent variation related to distribution. Since seed does not maintain viability in storage it is necessary to maintain collections as living trees. This provides the opportunity to observe patterns of variation in tree performance related to geographic origin. Repository collections have been the foundation for the development of molecular genetic methods of characterization in Carya, and have been pursued in conjunction with refinement of phenotypic descriptors necessary for selection in the breeding program. The first few microsatellite markers (SSRs) were used for cultivar verification and analysis of the geographic distribution of genetic diversity. Appropriate targets for use as reference genomes were identified and sequencing initiated. Utility of the draft template sequence has engaged a broader team of scientists in the characterization of diversity. How that diversity can be productively and cooperatively integrated into development of multiple national and international breeding programs, while protecting the diversity and resilience of native populations and producers, is a challenge for the next generation to which Vavilov’s concepts continue to contribute. Bio: Dr. Emily Combs is a Research Scientist for DuPont Pioneer in Mankato, MN. Dr. Combs is a corn breeder whose research focuses on increasing genetic diversity in 95-105 CRM corn. She received her Ph.D. in Applied Plant Sciences for the University of Minnesota -- Twin Cities where she was advised by Dr. Rex Bernardo and researched genome wide selection in corn. She received her Bachelor of Science in Biology with a concentration in genetics and development from Cornell University. 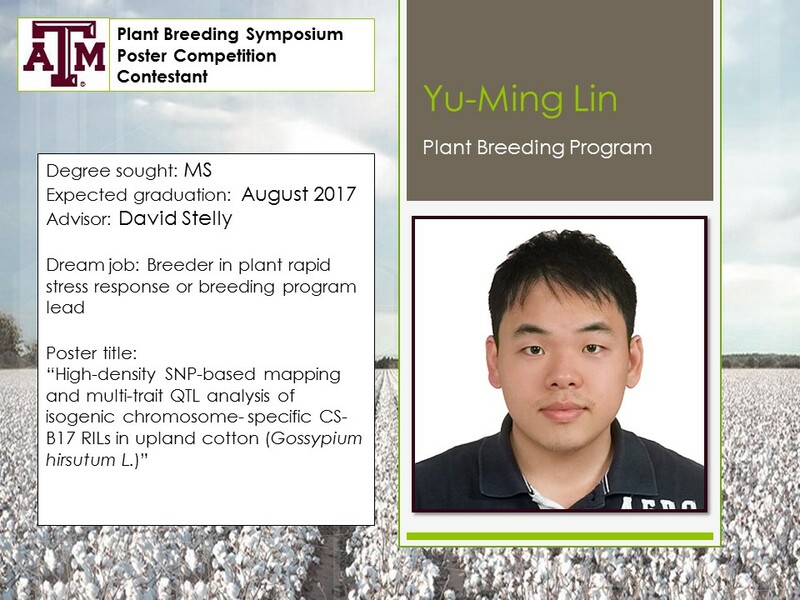 Abstract: Breeding with diverse germplasm is an important tool for breeders as we strive to continue improving yields while confronting new environmental conditions and disease pressures. Introducing diverse germplasm can allow breeders to immediately improve specific traits, to increase overall genetic variation and hence genetic gain, and to hedge against future breeding pressures. 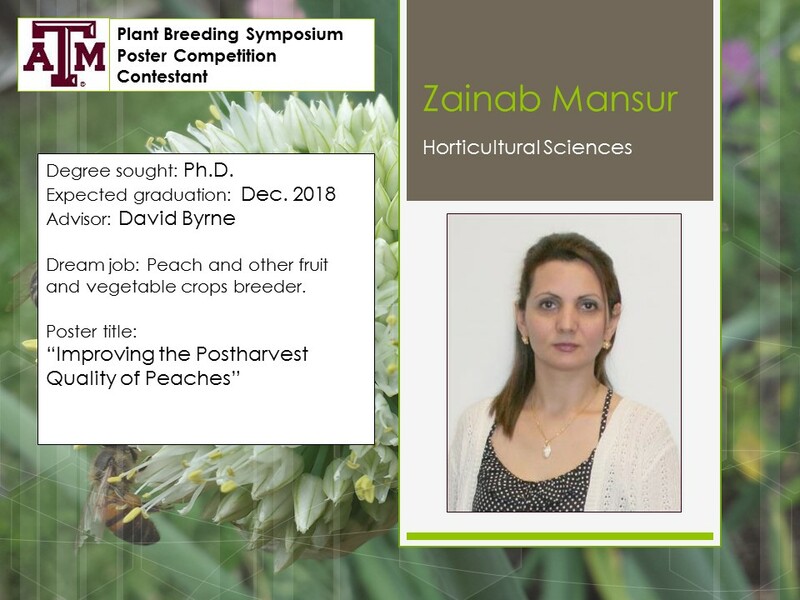 Here two examples of diversity breeding in a commercial program will be presented; one which targets a qualitative disease resistance trait in soybeans and one which targets a quantitative disease resistance trait in canola. Finally, a reflection on the successes and main challenges faced every day in a commercial corn breeding diversity program. 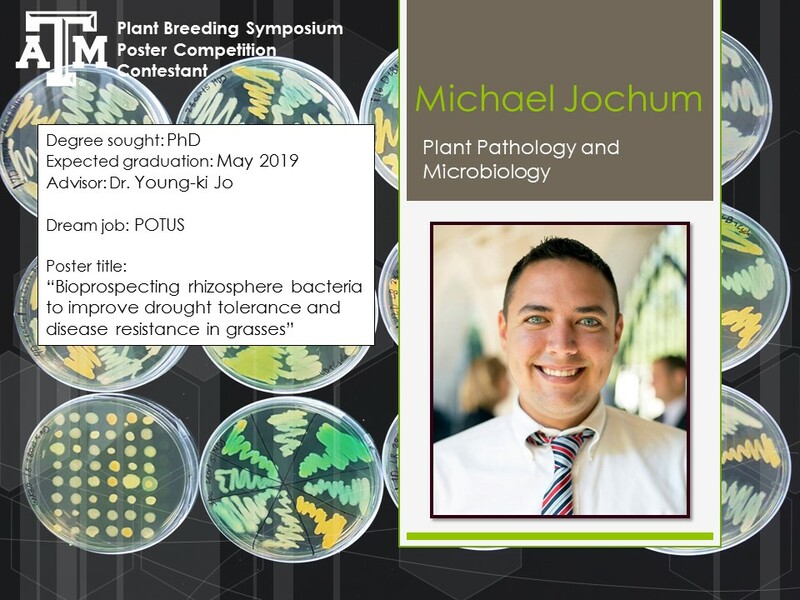 Bio: Mitchell Schumann received his bachelor’s degree in Plant and Environmental Soil Science from Texas A&M University in 2012. He then attended North Carolina State University where he worked on association mapping in autotetraploid potatoes, and graduated with his Master’s degree in 2015. 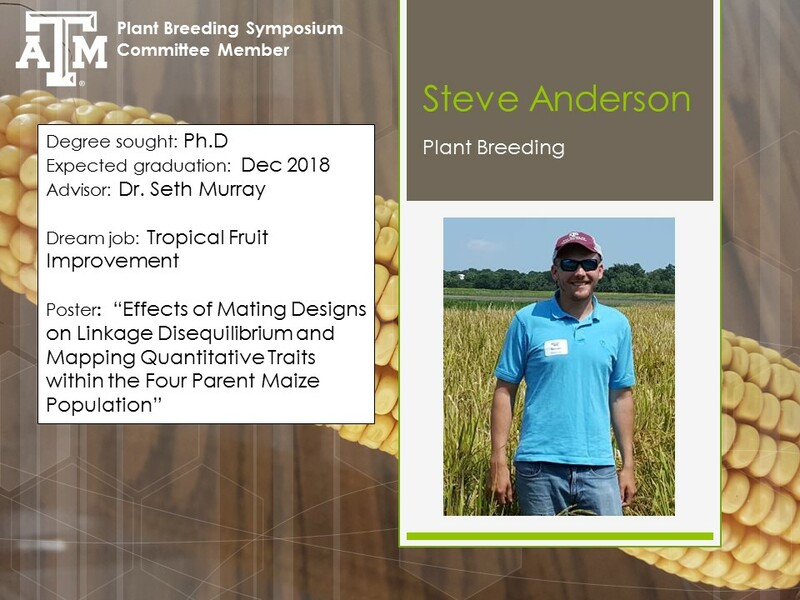 He returned to Texas A&M that same year as a Cotton Incorporated Fellow where he currently works under Dr. C. Wayne Smith towards his PhD in Plant Breeding. Abstract: Population structure plays a large role in modern genome wide analytical techniques such as genome wide association studies (GWAS) and genomic selection (GS). The nesting of trait alleles within population structure can hinder the ability to detect QTLs in GWAS, and reduce prediction accuracies in GS. Identify potential nesting of alleles can aid in decisions about population development, and interpretation of results in such analyses. In this study, a population was developed to represent obsolete U.S. cultivars from the U.S. National Cotton Germplasm Collection. This population was analyzed for population structure analysis using Principle Coordinate Analysis and fastStructure. Logistic Regression was used to identify markers that show an effect on population structure. Linear Discriminant Analysis (LDA) was then used to fit a multivariate model for predicting previously identified population structure. Feature selection from the LDA model identified markers most informative for classifying population structure. Fiber quality data such as fiber length and strength were then associated to the remaining markers to determine potential nesting of fiber quality alleles within population structure. Bio: Brian is in his final year of his doctoral degree in Plant Breeding at Texas A&M University working in Sorghum Breeding & Genetics. His research focuses on human nutritional traits in grain sorghum, including improvement of antioxidant levels, protein digestibility, and grain color. 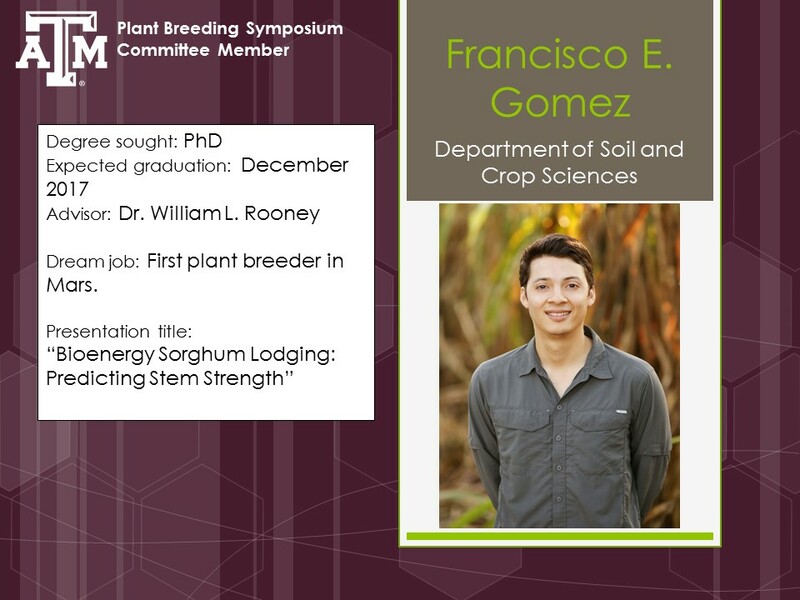 During his graduate career, Brian founded the Texas A&M Plant Breeding Symposium and co-chaired the committee in 2015 and 2016. He also founded and currently serves as President of the Soil & Crop Sciences Graduate Organization. Brian received his Bachelor of Science in Agronomy from Iowa State University and his Master of Science in Plant Breeding from Texas A&M. His career goal is to become a plant breeding scientist for a company within the global seed industry. His family produces corn and soybeans on their farm in central Illinois. Abstract: The evaluation of genetic gain in field crops is essential to assess past and future trajectory of crop improvement. In grain sorghum [Sorghum bicolor (L.) Moench], total sorghum production area plateaued in the U.S. in the 1960s and experienced significant decreases in the late 1980’s. At the same time, grain yield increased 0.48 t/ha annually in the U.S., but most of that progress occurred from 1950 to 1980. These trends are caused by numerous factors ranging from shifts in production environments to reduction in research and development programs. Since sorghum is produced in relatively marginal environments, sorghum breeders often focus on improving resistance to abiotic and biotic stresses to protect yield, rather than maximizing yield potential. To understand recent effects of breeding as well as the long-term genetic gain, sixty hybrids and their respective parental lines from the Texas A&M AgriLife Research Sorghum Breeding Program were grown in five diverse environments across Texas in 2016. These hybrids represent the genetic material released from the breeding program from the 1960s until today. Over the last 55 years in the Texas A&M breeding program, yields have increased .008 t/ha annually. Days to maturity, panicle size, test weight, 500 seed weight, and grain number per panicle demonstrated significant changes while traits such as leaf angle and number of panicles per area have been constant, and plant height has decreased by .14 cm annually. As the data indicate, the rate of genetic gain in sorghum have been slower than other major U.S. field crops. Bio: Nolan Bentley is a 3rd year PhD student in the Department of Horticultural Sciences. Nolan graduated from Texas A&M University in 2010 with a bachelor of science in Biology and a science-composite teaching certification. He then spent three delightful years teaching Biology, Chemistry, and Physics in Cypress-Fairbanks ISD. In 2014, he returned to A&M where he began work in Dr. Patricia Klein’s lab developing genomic resources for pecan. These resources include SSR and SNP genetic markers, genotyping by sequencing methods, linkage maps, and QTL mapping. This work is in cooperation with Dr. L.J. Grauke of the USDA-ARS National Clonal Germplasm Repository for Pecans and Hickories. The intent of these resources is to help researchers better characterize, conserve, and utilize the germplasm of pecan and the other hickories. Abstract: Pecan (Carya illinoinensis) is an outcrossing, highly heterozygous, and slow to mature tree native to North America. Programs such as the USDA-ARS Pecan and Hickory Germplasm Repository are tasked with collecting and protecting this plant’s germplasm and utilizing it within breeding programs. This goal necessitates the development of genomic resources capable of characterizing genetic relationships among native accessions and interrelated cultivars in a high-throughput and cost-effective manner. This presentation describes the implementation of a genotyping by sequencing (GBS) technique to discover single nucleotide polymorphisms (SNPs) throughout the genome. This is the first reported use of this technology in pecan and represents a large step forward in the industry’s ability to measure genetic relationships with high resolution. Additionally, this presentation will describe the use of these SNPs to identify cultivars, clarify historical pedigrees, perform a genome wide association study (GWAS), and develop a linkage map. These resources are intended to benefit the pecan community by improving the ability of breeders and conservationists to characterize the germplasm collection. Bio: Heather Rose Kates is a Ph.D. candidate in Genetics & Genomics at the University of Florida and works in the Molecular Systematics and Evolutionary Genetics Laboratory of Drs. Pamela and Doug Soltis at the Florida Museum of Natural History in Gainesville, FL. Heather's interest in the intersection of basic research, botany, and science literacy led her to study the evolution and genetic diversity of wild and domesticated pumpkins and squashes (Cucurbita) for her Ph.D. research. In the future, Heather hopes to continue using innovative wet-lab and bioinformatics methods to answer questions that encourage collaboration among botanists and plant breeders and increase public understanding of how evolution and genetics influence food production. She earned her BA in biology from Oberlin College in Oberlin, OH. Abstract: Domestication genomics studies compare the genomic content of crops and their diverse wild relatives to provide insight into the genetics underlying domestication and agronomically important traits. Phylogenetics provides the framework for these studies by resolving relationships between crops and their wild relatives, thereby identifying the closest wild relatives of cultivated plants. Pumpkins and squash (Cucurbita) were domesticated six times from independent wild relatives and are a unique system in which to study domestication processes and traits; however, previous phylogenetic studies of the Cucurbita crops and their wild relatives suggest histories of deep coalescence that complicate uncovering the genetic origins of the six crop taxa. We investigated the evolution of domesticated Cucurbita and their wild relatives using the most comprehensive and robust molecular-based phylogeny for Cucurbita to date based on 44 loci derived from introns of single-copy nuclear genes. We discovered novel relationships among Cucurbita species and recovered the first Cucurbita tree with well-supported resolution within species. Cucurbita comprises a clade of mesophytic annual species that includes all six crop taxa and a grade of xerophytic perennial species that represent the ancestral xerophytic habit of the genus. Relationships among individuals within crop-wild species pairs point to three patterns of crop evolution in domesticated Cucurbita, and we find closer relationships between diverse wild species and crops than previously identified. Our phylogeny clarifies how wild Cucurbita species are related to the domesticated taxa and provides a framework for domestication-genomics studies of Cucurbita crops. We present preliminary results from domestication-genomics studies for two of these crops. Bio: Derek Barchenger is a Ph.D. candidate working in the chile pepper breeding and genetics program in the Plant and Environmental Sciences Department at New Mexico State University. Derek’s dissertation research focuses on breeding for resistance to Phytophthora capsici, identifying the genetic mechanisms of fertility restoration, and developing a method to more efficiently produce breeder seed in chile pepper. 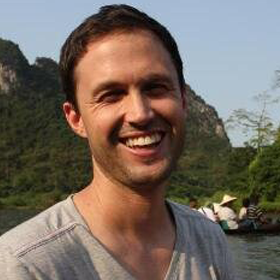 As a result of his initial Ph.D. dissertation work, Derek received the U.S. Borlaug Fellows in Global Food Security Award, granting him a visiting fellowship at the World Vegetable Center in Taiwan to conduct research in disease resistance. For his M.S. 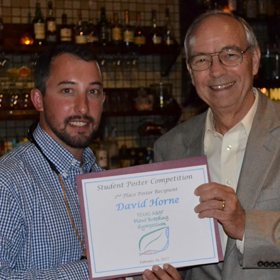 research at the University of Arkansas, Derek evaluated the nutraceutical content and storage potential of muscadine grapes in the small fruit breeding program. Derek’s interest in genetics and plant improvement stems from his passion for eliminating food insecurity and increasing the sustainability of agriculture production. Derek’s career goals center upon educating the next generation of plant breeders, improving the lives of people, and developing more nutritious cultivars resistant to disease, pests, and environmental stresses. Abstract: Phytophthora capsici (Leon.) causes severe losses to chile pepper (Capsicum sp. L.) production worldwide. One major limitation to breeding for resistance to P. capsici, is the lack of a widely used race characterization system. Additionally, linkage drag associated with poor horticultural traits is often an issue with current sources of resistance. Our objective was to identify a more universal system o-f race characterization of P. capsici, as a basis for a global anticipatory breeding program in chile pepper. At the World Vegetable Center, we evaluated the usefulness of the New Mexico Recombinant Inbred Lines (NMRILs), derived from a hybridization between ‘Early Jalapeno’ and the landrace Criollo de Morelos-334. Collected in Mexico, Criollo de Morelos-334 had the highest level of resistance among hundreds of screened accessions. Between May and August of 2016, isolates were collected from chile pepper production regions in Taiwan. Using the NMRILs, 24 new races of P. capsici were found on the island. Additionally, the virulence varied by region, with isolates collected from the west coast being more virulent than those collected from the east coast. Virulence based on geography allows for development of locally resistant cultivars. The usefulness of the NMRILs to characterize races of P. capsici in Taiwan provides a global scale approach that will help plant breeders and pathologist limit losses due to Phytophthora blight. Bio: Pablo Gonzalez Barrios is a first year of Ph.D. student in the Agronomy Department of the University of Wisconsin at Madison. 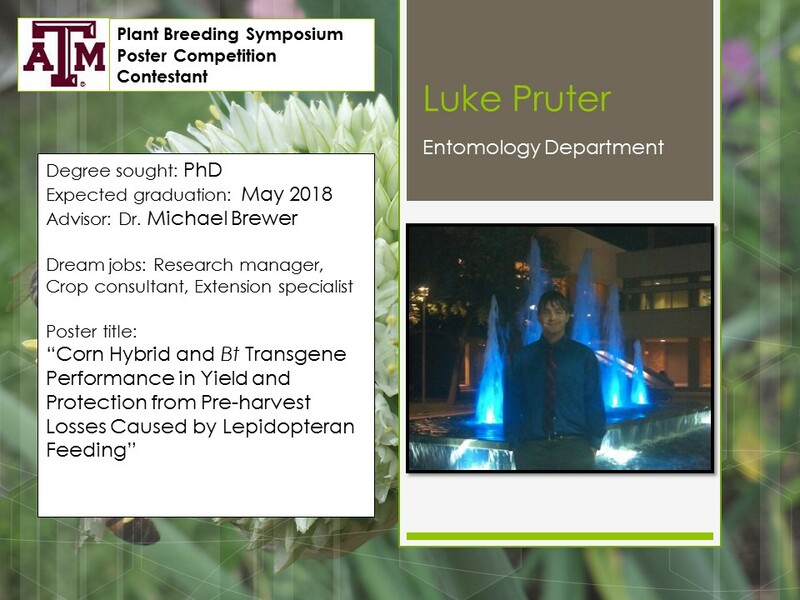 His major is Plant Breeding and Genetics Program working with Dr. Lucia Gutiérrez. Pablo is originally from Uruguay where he worked as a teaching/researcher assistant in the Statistics Department at the Agronomy College of the University of the Republic. He received his bachelor’s degree in Agronomy and his Masters in Biostatistics working in topics related to geostatistical tools applied in forest production systems of Uruguay. 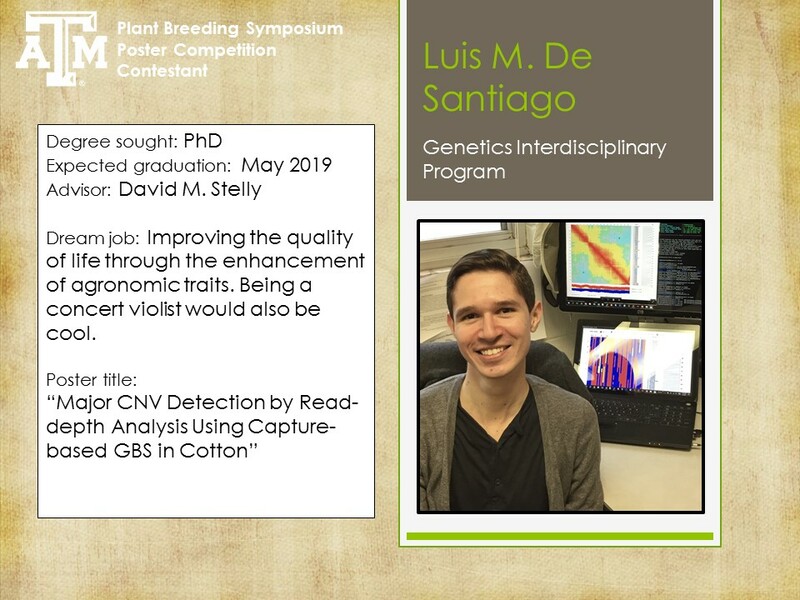 He is currently working with Dr. Gutierrez as research assistant in the development and implementation of genomic selection tools applied to small grains breeding programs. His research is focused on studying the phenomena of genotype by environment interaction through the more efficient use of environmental information. For example, better characterization of the environmental effect through environmental covariates, incidence of diseases and interactions with soil conditions can be a useful tool to improve the predictive accuracy of the models. 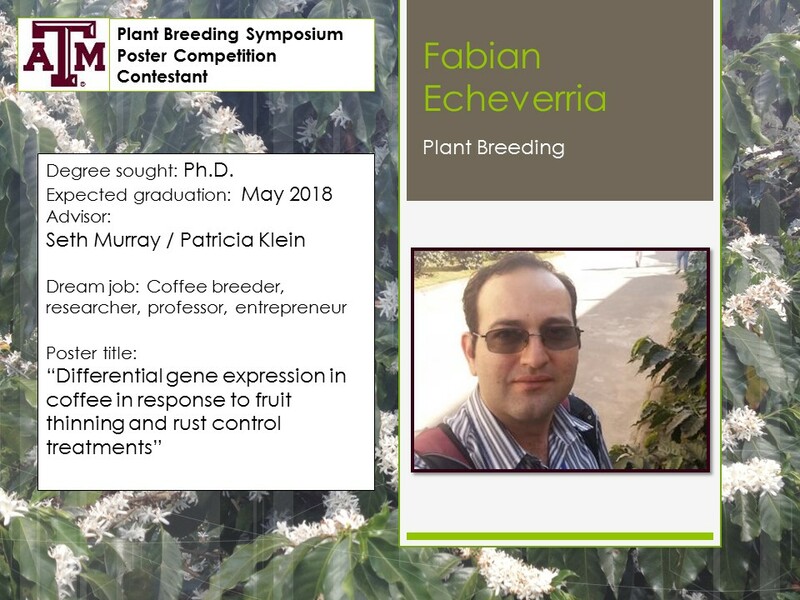 Furthermore, he is interested in evaluating the efficiency of multi-environmental trial networks in order to improve the efficiency of selection of superior cultivars in plant breeding programs. Abstract: The study of the genotype by environment interaction (GEI) is crucial when evaluating phenotypic performance in multi-environment trials. The inclusion of GEI information within genomic selection models has shown improvements in prediction accuracy and selection. Some environments are repeatable and predictable. However, year to year varieties are not predictable unless environments are characterized in repeatable components such as temperature, precipitation, solar radiation and other environmental covariates (EC). The objective of this work was to evaluate different strategies to model GEI by incorporating selected EC into prediction models. Information from the Uruguayan National Breeding Program was used. Yield performance of 74 elite lines evaluated in 19 years sowing-date combinations were used (2010-2014) and genotyped by sequencing. Daily weather information for temperature, relative humidity, radiation and rainfall was used. EC using the most relevant meteorological variables were calculated for each genotype, sowing date and year, for the physiological periods. Mixed models were used to predict by-environment (GBLUPgxe), using an equal environmental correlation with EC (Cov_gxe) and using and environmental correlation matrix with EC as fixed effect (Cov) for different sets of environments. Predictions were made for each year using information from the remaining years of evaluation. The prior selection of EC is useful at the time of improving the predictive ability of the models. In most years the Cov model showed significantly higher predictions accuracy. However, in 2010 there were no significant differences between strategies. The inclusion of EC improves the predictive ability of genomic prediction models in predictions by years.